I am appalled at some trends in the User Interface design these days. Touch screen devices became an entrenched market a couple years ago, and suddenly everyone and their mother decided to optimise the User Experience (UX) to take into account this new animal. Nothing bad about the general idea, but unfortunately in some cases the results seem to have been the apparent devolution of the UI design. The very first thing that you should do… no, let me try again. The very first thing that you must do after installing and opening the new Premiere Pro CC is to set a keyboard shortcut for Deselect All. Trust me. This will save you a lot of trouble later. This is something that you must do as well, if you think that applying transitions in Premiere no longer works. Open the Edit menu, choose Keyboard Shortcuts…, and in the search box type “deselect”. Fortunately only one option will be visible, the one that appears in the Edit group – “Deselect All”. Assign a shortcut to it which will be easy for you to remember. I sincerely recommend D , because D is also used to apply default transitions. And if you have used Premiere before CC, you will have to learn this new shortcut combination: D , Cmd /Ctrl + D to apply the default video transition, or D , Shift + Cmd /Ctrl +D for audio transitions. Set this shortcut right now! Premiere Pro CC introduces what is called “the primacy of selection”. Translated to plain English it means, that if you have anything selected in the timeline, Premiere will attempt to use the selection for any operation you choose, disregarding track selections, playhead position, etc. While there is an argument to be made that it’s more effective, more consistent (well, perhaps some day), it is changing the behavior which was long established in Premiere – using the playhead position for applying transitions. Here’s how the new behavior works: if a clip is selected, and it is between two other clips, nothing happens. If the clip has at least one edit point where it does not touch anything, then the selected transition is applied to the loose ends. And if multiple clips are selected, the transitions are additionally applied between these clips. Not very obvious, right? The clip on track V2 is selected. You might not even notice it. At least I didn’t! And here’s the result – instead of applying the transition to the edit point under the playhead, the selected clip receives the transitions on both sides. If you are like me, and you select and deselect clips all the time, whether to adjust effects or for any other reason, then this new behavior is going to bite your muscle memory hard. Before you learn the D , Cmd /Ctrl +D combination, you will find yourself cursing two times: once when the desired transition does not appear in the place you think it should, and the second time, when during preview you find stray transitions in various places. This is the collateral damage or “the primacy of selection”. If you forgot to deselect, and want to use the old way of applying transitions – by the track selection and playhead position – then you are screwed, and need to adjust. It does not help to know that this behavior is the result of Final Cut Pro’s inability to select multiple edit points at once, and was introduced there as a remedy to this limitation. Supposedly a lot of FCP users asked for this functionality in Premiere. They got it, and it came at a cost to established workflows. Like the introduction of patch panels in CS4, only more mischievous, because the results may not be immediately visible. Here the selection is a bit more obvious. Watch what happens, when the shortcut is pressed now. The transitions are applied at the end, and in between the clips. Remember to learn the new combination of keys – D, cmd/ctrl+D – if you want to use the playhead to apply the transitions. To add confusion, there is a keyboard shortcut to “Apply Default Transition to Selection”, which works exactly like Apply Default Transition if clips are selected, although it applies both audio, and video transitions. My little mind can’t comprehend the idea behind this change, especially since I’m not the only one who was taken aback upon the first encounter with the new behavior. But I know of others who are happy about it, and I found some use of it as well… only to encounter a stray transition during the final viewing of a recent production. So remember – D , Cmd /Ctrl +D is your new shortcut for Apply Default Transition at the Playhead. Mouse-driven editing has usually been associated with the lower end of video editing, and to a certain extent justifiably so. If I see a person using only his or her mouse to edit, I don’t consider them very seriously. Editing is a tough job, and a human being has two hands, so why not put both of them to work? Put that left hand on the keyboard right now! The question of whether the right hand should spend more time there as well or not is debatable. Even though I have been driven through CS6 mixed bag of innovations to make more extensive use of my touch-typing skills during editing, I am still looking to improve on the mouse side of things, because the hybrid mouse + keyboard editing has been historically the fastest way to use Premiere. When it comes to mouse mastery, nothing can beat 3D artists, especially modellers. The necessity to constantly change the point of view in three dimensions clearly showed that not only a single mouse button is not enough, but that even two will not suffice. You need a 3-button mouse to work in a 3D application. Period. Granted, using the middle button with most mice is something that requires a bit of practice, since often it entails pushing on the scroll wheel. However, the newly acquired skill gives you more flexibility, and options. Why then not use a 3-button mouse in editing? And why not take advantage of the fact, that pushing the middle button is not as easy, as pushing the other ones? One thing that I found myself using a lot during mouse-driven editing was delete and ripple delete. Even after remapping my keyboard, it still remained a two-click process. First select the clip, then hit delete. Fortunately you can use both hands, but still, there is some space for optimization here. The middle mouse button could be used to perform a single click ripple delete. Another idea for middle mouse button is to map it to “Deselect all”, and it might become pretty handy with the incoming CS Next confusion about the primacy of selection over playhead, or targeted tracks for example during applying transitions. Both of these options are available now via many macro recording and automation pieces of software. Personally I use the ones that came with my mice – either Microsoft’s IntelliMouse or Razer Synapse. They both allow remapping the middle mouse click for certain applications to a macro or a shortcut key (and much more, if you wish to explore them further). Therefore I first make sure to create the keyboard shortcuts to “Ripple Delete” or “Deselect All”, and then to map these shortcuts to the middle mouse button. And voila! Single click ripple delete or deselect all are literally at your fingertips now. The quest for ever more efficient editing continues, and I hope to have some exciting information for you soon. In late September 1944 Field Marshall B. L. Montgomery, a very bold and talented British commander, led an ambitious offensive whose objective was to force an entry into Germany over Rhine. He aimed to capture a series of bridges with the help of paratroopers, who would have to defend them until the main forces arrived. Him and Premiere Pro have a few things in common: they are both audacious and tend to overreach. Monty’s boldness and wits won him a few battles, especially during his campaigns in Northern Africa. However, in this case his arrogance went a bit too far. Similarly, Premiere Pro also has its Arnhem moments. Premiere has always included the current frame in the in/out timeline selection, but until the latest release, it has not bothered me much. CS6 introduced a plethora of new features, which made me change my previous workflow from mouse and keyboard driven to more keyboard oriented, mostly due to the new trimming interface, and the unpredictability of the ripple tool, making the problem more pronounced. It used to be, that the arrow tool ( V ) allowed me to perform about 80-90% of operations by having the mouse in my right hand, and the left hand on the keyboard close to the Ctrl (that’s Command for you, Mac people) key. If I wanted to trim, the arrow tool would intelligently turn into the trim cursor, when it approached the edit point. If I needed a ripple trim, I would press Ctrl , and I would always get the ripple trim tool for this operation. Then let go of the modifier, and I’m back with the arrow. 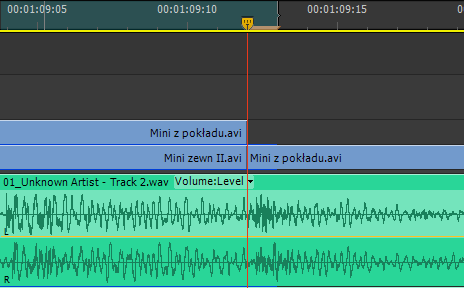 If I wanted to adjust audio levels, the arrow tool would allow me to raise and lower the value in the timeline, while Ctrl would add keyframes, and allow to manipulate them. The only actual tools I used were rolling trim (N ), slip ( Y ) and slide ( U ). Rarely rate stretch ( X ), as handling the speed changes by Premiere for interlaced footage is pretty uninspiring, and from time to time track selection tool ( A ). I don’t remember ever needing the tool palette, and found myself constantly switching it off to save some screen real estate. Then comes Premiere CS6 with its ability to select edit points, and improved trimming. And suddenly, this old workflow seems less and less viable. The hot zones for edit point selections are pretty wide. One has to be careful not to suddenly click on an edit point, because then the trimming mode will be activated, and ctrl will no longer act in predictable manner, giving you the ripple trim as you’d expect. It will change its behavior based on what is selected, and in general make manipulating timeline with a mouse much less efficient. It’s understandable then, that I found myself drifting more towards the keyboard-oriented workflow, using trimming mode ( T ), setting in ( I ) and out ( O ) on the timeline, and finally learning keyboard shortcuts for lift ( ; ) and extract (apostrophe) – something, that I never needed before, because ripple delete, razor tool (C ) and add edit ( Ctrl+K remapped to Z ) were simply quicker. I even started to enjoy the new way of doing things. And all would be fine and dandy, were it not for the already mentioned fact, that Premiere marks the currently displayed frame as part of the selection. Which means, that if you position your playhead on the edit with the nicely defined shortcut keys (up and down arrow in my case), and press O to mark the out point, you will include also a single frame after the cut. This is a bit problematic. exporting based on the in/out selection. 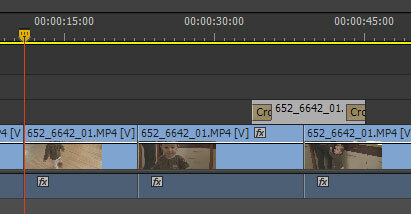 I enjoy editing in CS6 a lot, but this “feature” literally keeps me up at night. It’s such a basic thing, that even Avid got this one right… When the playhead is positioned on an edit point, the out point is selected as the last frame of the incoming clip. Why then does Premiere behave like Montgomery and has to go one frame too far? British Field Marshall also wanted to eat more than he could chew, and in the end he had to withdraw. Every time I have to go back a frame, I feel like I’m loosing a battle. Why? Not one frame back, I say! There’s a tip that I wanted to share with you, which increased my productivity with Premiere Pro tremendously. And it’s very simple: customize your keyboard shortcuts. But make it wisely. First tip: make use of the search box which is present in Keyboard Shortcuts dialog in Premiere. There is a ton of shortcuts, and if you know the proper name, or even part of the name, it’s easier to type it in the search box, and browse among the remaining entries, than to wade through all the options. Separated from source patching in CS4, constantly improved, but still hardly perfect, track selection tends to be one of the most annoying things if you don’t remember about it (like wondering why match frame shortcut does not work). It has also been pretty cumbersome. But in CS5 we got a nice addition that allows us to finally make it more of a feature than a nuisance. Then assign 9 to Toggle All Target Video On, and 0 to Toggle All Target Video Off. Track selection is vital to every editing operation in Premiere, and once you get used to the new shortcuts, I assure you, that you will never go back, and will be ready to strangle anyone who would like to take it away from you. Perhaps you might also find it useful to assign Toggle Target Audio 1-8” to Ctrl+1 to Ctrl+8 , although personally I found myself using only the shortcuts to Toggle All Target Audio On/Off (Ctrl+9 /Ctrl+0 respectively). Be mindful that shift+number shortcuts are assigned to panels, but if you change them you will not be notified about it! And there will be no undo, you’ll have to revert these changes manually. And while we’re at it, why not map labels to Ctrl+F1 and further on? It’s a bit more complicated, you need to navigate to Edit->Label in the keyboard shorcuts dialog, and then assign keys to each label, but it also might be pretty helpful at times. Setting the In (I ) and Out (O ) are pretty decent standards, but some of the other shortcuts in this area are suboptimal, considering the fact that you need to perform thousands of this kind of operations a day, and adding half a second to press Shift , or even Shift+Alt+Ctrl is a pain. This time it’s worthwhile to take example from Avid, and get these under your fingertips. The most important one: Clear In/Out – map it to G . This used to be Premiere’s default before FCP users started to put pressure on Adobe to adopt their keyboard mapping. Clear In and Clear Out is not something I use very often. If I want to change the In, I just set an In in another place. However, if you find yourself using them often, E and R seem to be pretty good places to put them. On the other hand Go To In, and Go To Out tend to be useful, and I map them under Q and W .
Mark Clip also tends to be useful for many reasons, gap removal included, and I tend to have it under the slash key / . Mark Selection – not so often used, I map it to Shift+/ . Setting Render Entire Work Area to Shift+Enter is worthwhile. I generally turn off the work area, and use In and Out, and this option is replaced with Render In to Out in my workflow, but the shortcut stays the same. An idea that navigating markers should use the M key is quite alien to me. I prefer having Go To Next Marker as Ctrl+PgUp , and Go To Previous Marker as Ctrl+PgDn . It frees the M key for more important things, like for example assigning Edit Marker to Shift+M . Another function that I often use is Add edit, and Add edit on all tracks. Default Ctrl+K is not necessarily so bad, but it still requires at least two fingers. Let’s reduce it to one. Throw out the zoom tool shortcut (honestly, when did you last time use that one? ), and assign Add edit to Z , and Add edit an all tracks to Shift+Z . 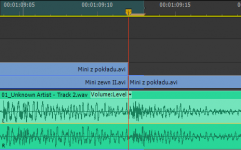 Speed/Duration and Audio Gain – who says that invoking dialogs needs a modifier key? Map them to D and H respectively. Who cares about the hand tool anyway? Ripple Delete – default Alt+Backspace is almost fine, but why not map it to the del key itself? You’ll have to remember that the Backspace and del will then have different behavior but I think it’s worth it. I would map it to backspace, but then it interferes a bit with the way project panel works, so delete is the way to go for me. They take time to get used to, because the shape of the characters is opposite to what it does, but their position is correct. I still sometimes press the incorrect one, but they are a real timesaver, especially in connection with track selecting. However, if you find yourself thinking too much, you might consider switching them, and seeing if it doesn’t work better for you. There are also two of the less often used – Extend Next Edit to Playhead and Extend Previous Edit to Playhead, which I tend to map to Shift+] and Shift+[ respectively. I have never used Extend Selected Edit to Playhead. Ever. Perhaps I still don’t know something about editing, but I have not come upon a situation where I couldn’t replace it with any other available option. For a moment I toyed with an idea to assign D to Apply Default Video Transition, but I decided against it. I needed other shortcuts much more, than I needed the transitions. If you tend to use any of these, definitely apply a shortcut to it. Also, if you use any other transition often, like for example Dip To Black (why it’s not in the list I have no idea), then use this one as a default transition, and apply a shortcut to Crossfade. Possibilities are really interesting, and I sincerely urge you to explore them. Feel free to use it and distribute it as you wish. However, I strongly urge you to explore keyboard shortcuts on your own. I hope you’ll find these tips as useful, as I do. Enjoy. In the video world Adobe Bridge tends to be under-appreciated. It’s true, that it was mostly designed to work with stills and assets for web development or desktop publishing. But it does have some rudimentary video preview options that most people are unaware of. Secondly – there is an option to group pictures into so-called stacks, and set the frame rate at which the stack will be played. Simply select the whole image sequence, press ctrl/cmd+g, and voila! The stills will disappear and the thumbnail will change, giving you the possibility to see how many frames there are (upper left corner), and to play it back (the icon and slider above). The frame rate can be set by going to Stacks->Frame Rate and selecting the proper number. Unfortunately, you can’t play the sequence in the preview area, only in the thumbnail area – I have no idea why. I have three ideas that would make Adobe Bridge into a sensible video review tool. Frame by frame playback for video files in full screen mode using simple keystrokes. Video scrubbing like in Premiere Pro CS6. Possibility to add markers and comments for a given frame or a number of frames, which later on would be read by Prelude, Premiere, After Effects and other Adobe applications. Similar functionality was present in Adobe Clip Notes and later in Adobe CS Review that was discontinued in April 2012. I guess it is coming back in another form to Creative Cloud, but right now we’re left in a void. And come to think of it – why only markers? Why not set an in-point and an out-point as well? And integrate with Adobe Anywhere? Huh? For those who are interested in supporting my ideas, here’s the link to the idea on the photoshop.com, where you can vote it up, so that people in Adobe community notice it.